The lower level of 111 South 17th Street has seen its fair share of venues. The space has been known as 1925, G Lounge, and most recently Clubhouse. While none of these concepts has been able to stand the test of time, it is now being reinvigorated as a sports bar that isn’t quite ready to let go of its nightclub roots. Stats on 17th has an interesting vibe. When you walk in, it is immediately clear that the place used to house something more akin to a dance club than a sports bar–the ceiling is still painted black, and the middle seating area has a wall of mirrors that makes it hazardous for anyone wearing a short dress to climb in and out of the high top seats. However, it also is impossible to deny the appeal for fans of Philly sports when you see the wide bank of oversize HD televisions and plethora of sports memorabilia that line the walls. In the couch-filled viewing area, pillars are each decked out in honor of one of Philly’s professional teams. HD TVs line adorn nearly every wall inside Stats on 17th. 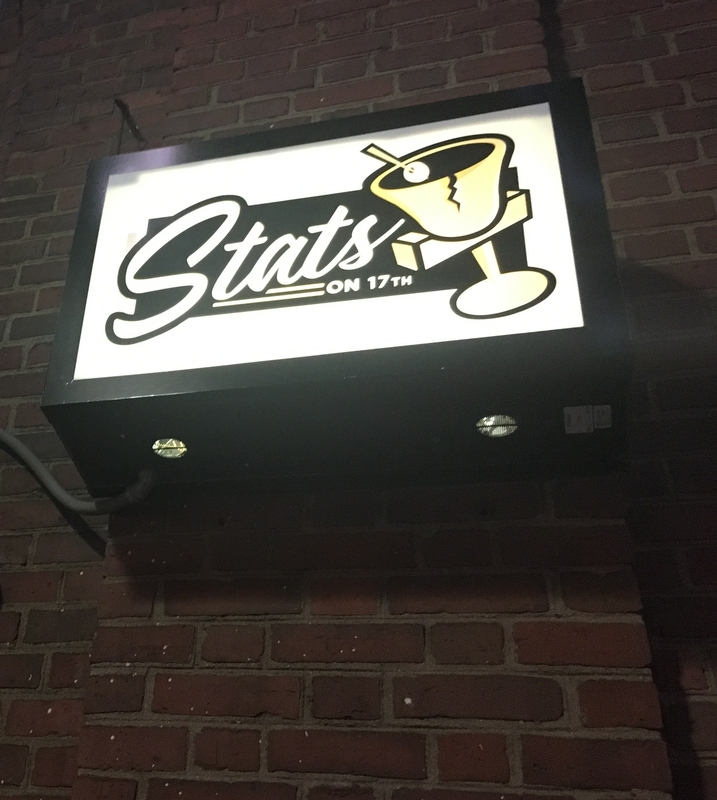 In addition to the impressive visual display, Stats on 17th also boasts two large bars and plenty of seating that ranges from comfortable couches to bar stools. The menu, billed as “elevated bar fare,” has a nice selection of pizzas, paninis, and appetizers. The buffalo chicken meatballs are especially good, with pieces of celery that may initially seem like a turnoff, but actually add a nice texture. The crab bruschetta is also great, with plenty of jumbo lump crab meat stacked on top. The two bars offer plenty of space to squeeze in and order your drink of choice. If you’re interested in trying a Stats special, or if you just want a fun photo for your social media feed, there is a “Stats Draft Tea” made with raspberry vodka and Twisted Tea that is served in a novelty cup designed to look like a blood bag. The one drawback for sports fans may be that Stats on 17th is still striving to appeal to club goers. For those who are interested in dancing, the spot will transition from sports bar to nightclub every Friday and Saturday night starting at 9:30. But even as early as 7 pm on a Wednesday, the music was so loud it was almost impossible to maintain a conversation. The sound system is excellent, which is great for those looking to dance the night away, but means there isn’t a quiet corner to be found. It may be best to avoid happy hour if you’re looking to catch up with coworkers or conduct business after hours. Stats on 17th is open for business at 111 S. 17th Street. They’re offering $5 16 oz Bud Light Eagles Bottles, $5 Truly Spiked Seltzers, $6 Green Tea Shots, and $6 Stats Draft Teas during Eagles games all season long, so if you’re looking for a new spot to watch the game, it’s definitely worth a look.